Chinese Four Herbs Soup (Sibut) – Learn how to make this nutritious Chinese Four Herbs Soup or often known as sibut. 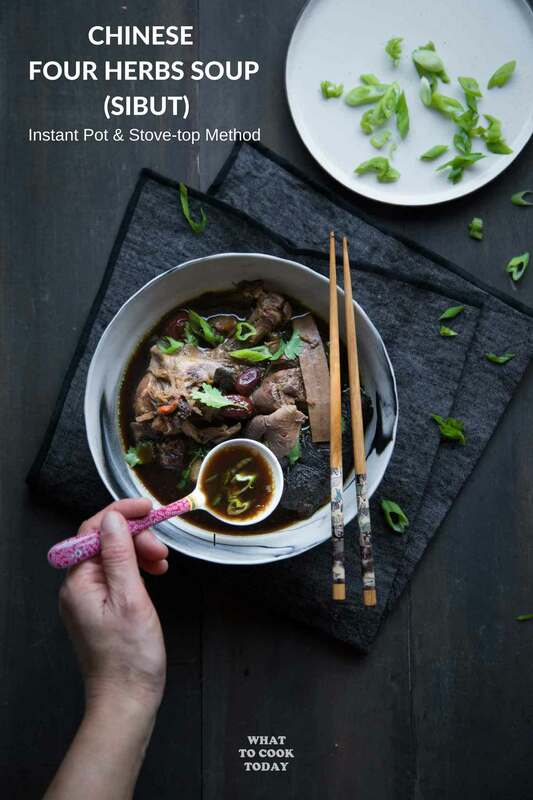 Both stove-top and pressure cooker (Instant pot) recipe are included. Confinement time when I just had our two kids. I like this Chinese four herbs soup because it is easy to make and mild in terms of flavor from the herbs. WHAT IS FOUR HERBS (SIBUT) SOUP? 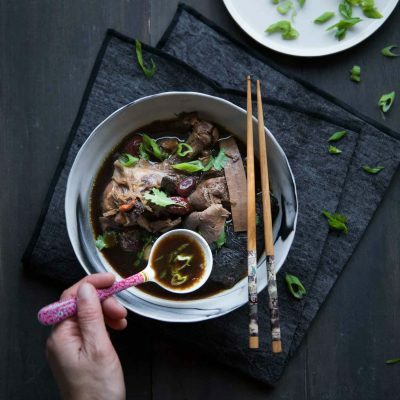 Sibut soup is a soup made with four type of Chinese traditional herbs (or more in most cases). 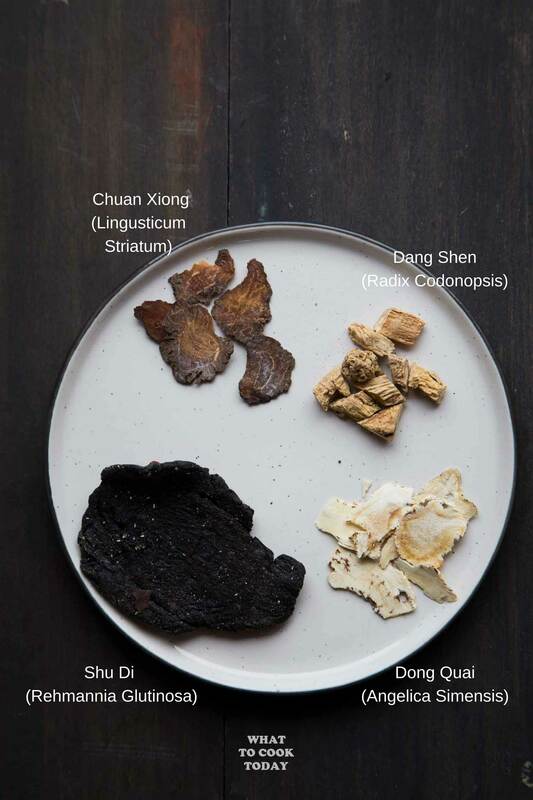 The four herbs my mom packs normally include Dang Gui (Angelica Root), Shu Di (Rehmannia glutinosa)-which contributes to the black color of the soup, Dang Shen (Codonopsis Root), Chuan Xiong (Ligusticum Striatum). Sibut is also conveniently sold in a packet with all the herbs already included at the Chinese Medicine Hall. But apparently, it is not confined to only 4 herbs. 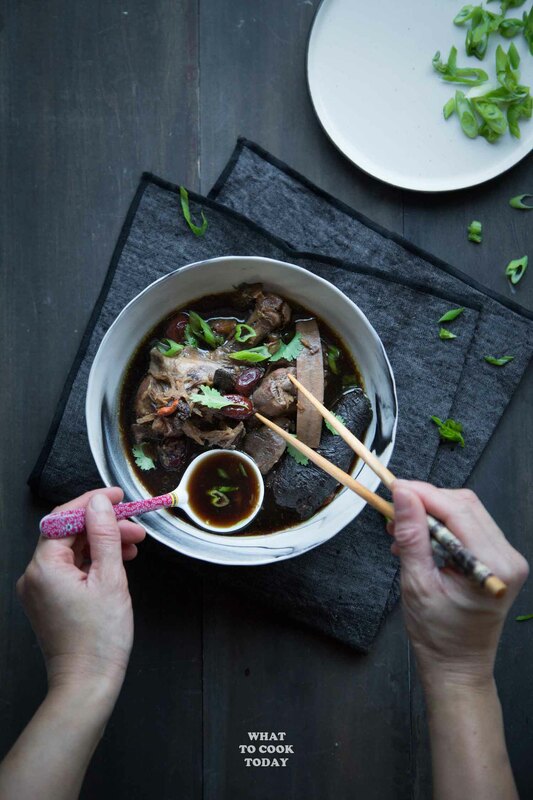 Sometime mom will add red dates, black dates, goji berries and other herb like yu Zhu (Solomonseal Rhizome) to the soup to improve the taste of the soup. Some people do not want their soup to be black in color and so they don’t use Shu Di in the soup. My mom said the type of herbs can be swapped and catered to whatever one wants. I used four herbs (sibut) plus the other four optional herbs in this recipe (picture below). You can just do four herbs. WHY IS THIS FOUR HERBS (SIBUT) SOUP IS BLACK IN COLOR? 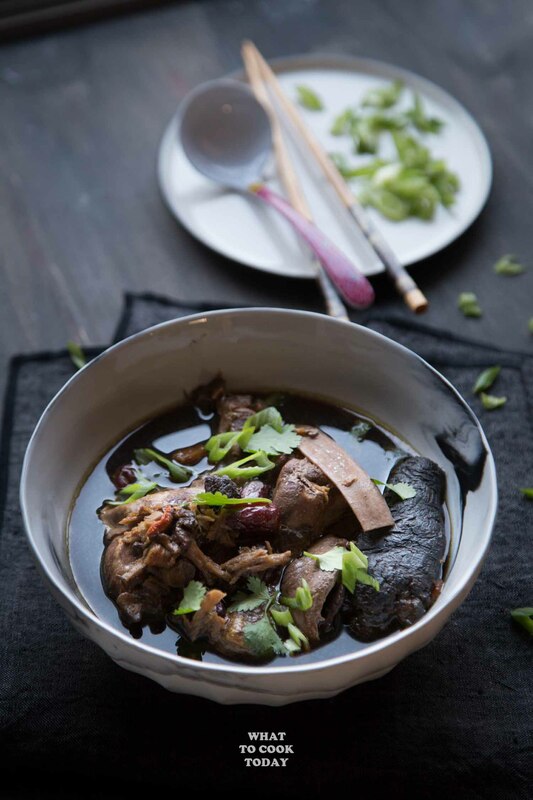 The black color is contributed by the black looking piece of herb calls Shu Di Huang (Rehmannia Glutinosa Root). They are usually sold in dried form. Once cooked, they will plump up and actually quite tasty. 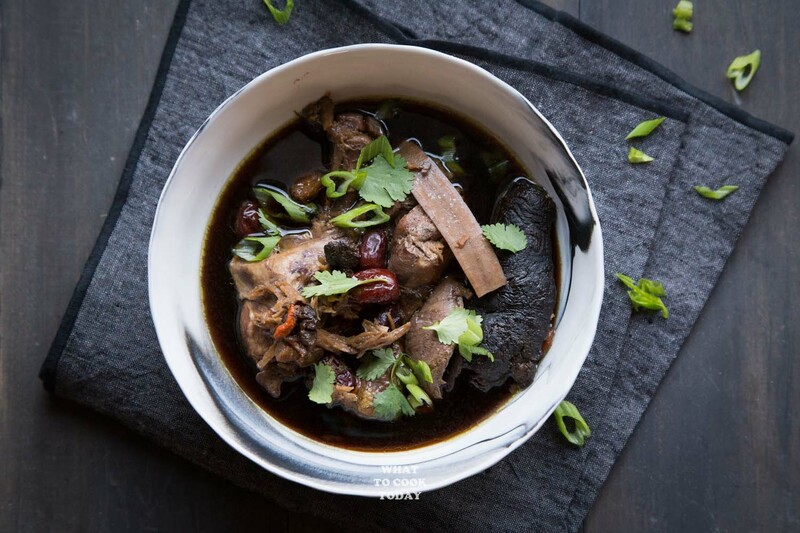 But, as with all traditional Chinese Medicine, one piece is usually all you need in this recipe and more is not always better too. WHAT IS THE BENEFIT OF CONSUMING FOUR HERBS (SIBUT) SOUP? Each of the Chinese herb has its own medicinal properties. It is said that in general, sibut can help to tonify the body especially for post-partum women, BUT, that doesn’t mean only post-partum women will consume this. Any adult with no specific medical condition should be able to consume this. The Chinese believe that it helps to strengthen body and improve blood circulation in general. I’m not a medical professional or TCM professional, so you should always consult your physician if in doubt. WHERE TO GET TRADITIONAL CHINESE MEDICINE? I do not recommend getting them online, unless you really know their reputation. 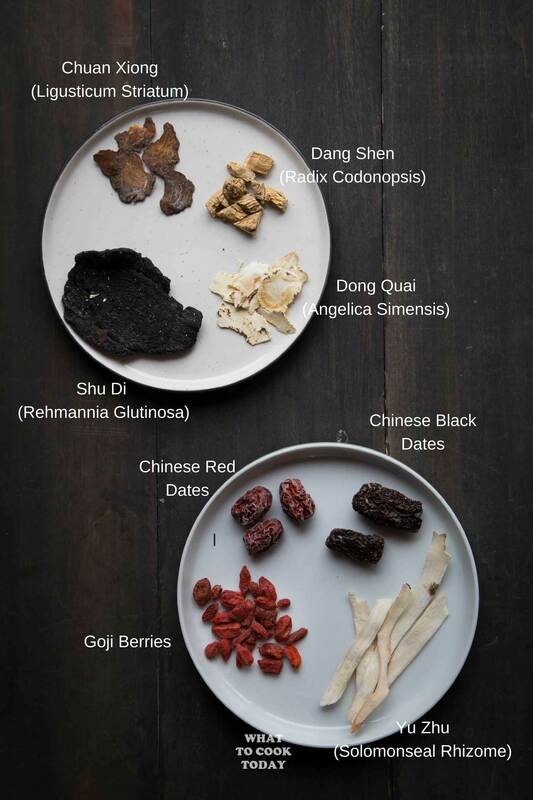 I include the scientific name of each of the Chinese herb, so you can bring this list to the Chinese Medicine Hall and get them, or easy yet, get the prepacked sibut. Goji berry is okay to be purchased online if you want to because it is a common ingredient now here in the U.S. and you can get good quality ones as many are selling them now. WHAT IS THE REASON OF ADDING GOJI BERRIES LAST TO THE SOUP? Mom often tells me not to overcook goji berries for a long time because they will make the soup “sour” when they are cooked for too long. So, I always add the goji berries last, they get soft quickly and still retain its sweetness that way. 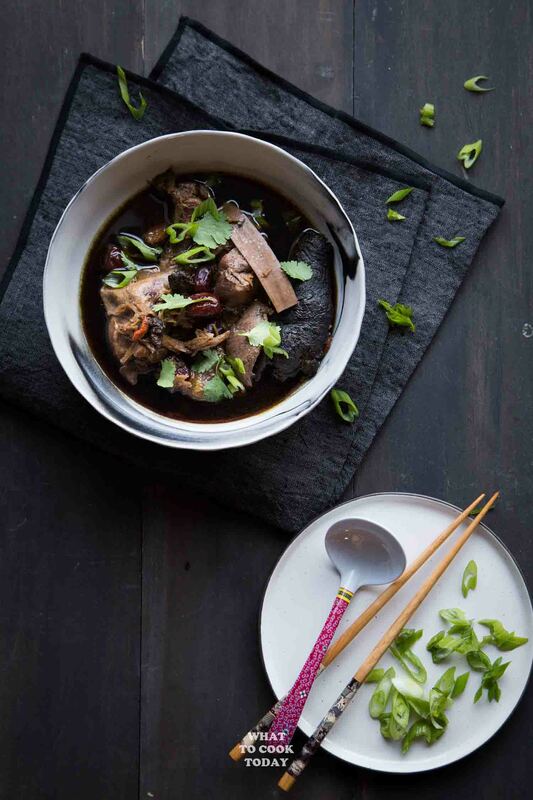 Learn how to make this nutritious Chinese Four Herbs Soup or often known as sibut. Both stove-top and pressure cooker (Instant pot) recipe are included. Hi! Thank you so much for this recipe! How long does this soup last in the fridge? Does it loose its benefits if in the fridge for too long? Also, will canning preserve this soup for longer? Thanks! You can keep the soup in the fridge for about 3 days. If you want to keep longer, I recommend you portion them out into serving batches and freeze. They can be kept for up to one month. And of course the longer you keep things, more nutrients will be lost. Honestly, I’ve never tried canning this soup before, but from what I heard, if you use a pressure canner instead of boiling water bath, it should preserve the soup longer. The boiling water bath probably not safe enough for preserving soup that has low acidity. I hope this helps! Is it okay to consume the cooked herbs or do you discard it? Hi Kris, you can consume the cooked herbs. I do that 🙂 or you can discard them too if you don’t want to.